China Special Jasmine Silvery Strawberry (balls) - China Restaurant ZEN in Adliswil, near Zurich. Famous for Peking duck and authentic Hong Kong style dim sum with organic ingredient and vegetarian menus. 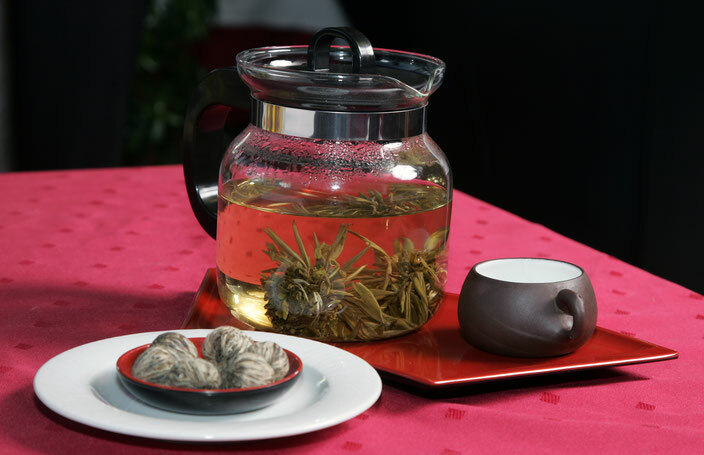 For this rare, top-quality green tea from the province Fujian, only leaf buds are selected, carefully bound into balls by hand and repeatedly scented with fresh jasmine flowers. When covered with hot water, the balls unfurl like flowers in the morning dew.